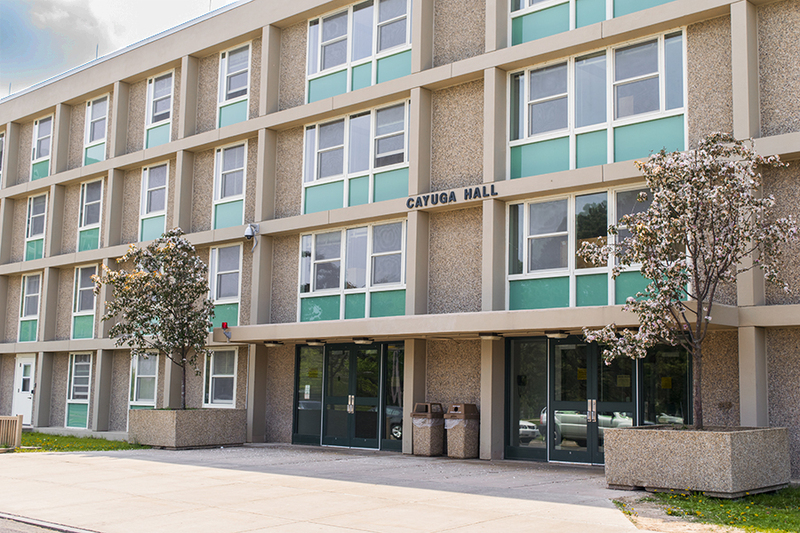 Completed in 1967, Cayuga Hall is a four-floor residence hall built in a “Figure 8” style. This means there are two courtyards confined within the building walls, giving residents a living environment with the option of using the private courtyards as their own outdoor space. Cayuga Hall, named for the Cayuga Nation of the Iroquois Confederacy, is one of four dormitory-style residence halls on West Campus. Each hall is named after a member of the confederacy. The Cayuga Nation, known as “The People of the Great Swamp” is found in the Finger Lake’s region of New York. The Cayuga Nation can be found with the Onondaga Nation on the east and the Seneca Nation to the west, according to the Cayuga Nation of New York website.